Henry, a member of the 1998 World Cup winning team and who was part of Roberto Martinez’s coaching staff with Belgium at the World Cup, was emerging as the overwhelming favourite after a fevered round of speculation which had linked Laurent Blanc, Jurgen Klinsmann and Claudio Ranieri with the job. 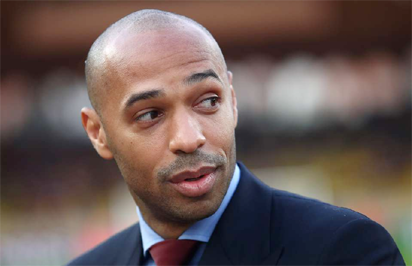 According to RMC Sport, Henry would say ‘yes’ if approached while the 20 Minutes outlet claimed the former Arsenal striker will Thursday travel to the United States to meet the GACP group, the American investors who will officially take over the Ligue 1 club on September 28. However, the club refused to comment on reports linking 41-year-old Henry with the coaching hotseat especially with Poyet officially still the man in charge. Poyet was suspended last Friday for a week after an angry outburst at club bosses over their transfer policy. “Technically everything is possible,” said club president Stephane Martin in reference to Poyet’s future, with a sacking looking a distinct possibility. The decision to suspend the Uruguayan comes after he launched a furious tirade at the Bordeaux board over their decision to sell the striker Gaetan Laborde to Ligue 1 rivals Montpellier.